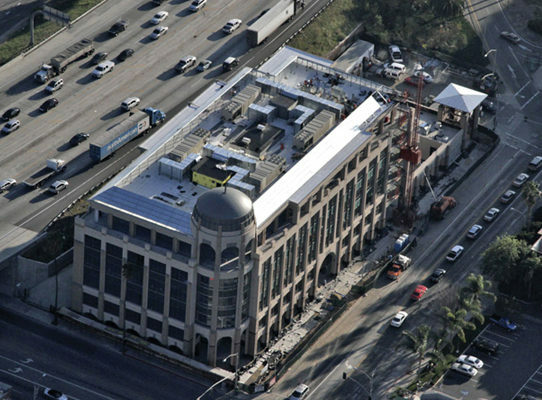 Citrus Tower entailed redevelopment of a 0.82-acre site in downtown Riverside with a 6-story, 133,000 square-foot office building over a four-level, 453-space, subterranean parking structure. 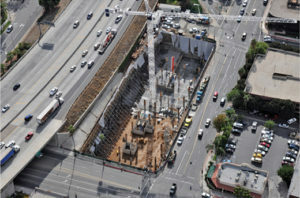 Klorman was the Design-Build contractor for the post-tensioned concrete subterranean parking structure and provided the concrete place and finish for the tower decks. The site is bounded by State Route 91 Freeway, the freeway onramp, and two of Riverside’s busiest streets and key corridors into downtown. This project was a logistical challenge due to the proximity to the freeway right-of-way as the freeway was being widened adjacent to the site, having to accommodate the shoring for the four level subterranean parking structure with no setback, and the construction of a tower crane in the middle of the excavation pit built into the subterranean parking structure to name a few. Also, the subterranean parking structure encroaches into one of the adjacent street right-of-way by thirteen feet, four feet into the roadway with four feet of cover. This required detailed coordination with the landscape architect for street tree placement on top of the parking garage as well as drainage for irrigation runoff and the use of structural soil to reduce the loading over the top of the garage.